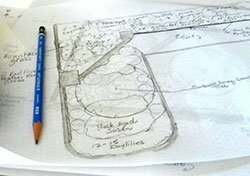 Did you dig in without considering garden design when you were starting out? That’s what I did. I just kept making my beds a little wider each year to put in more perennials. It was a matter of learning by doing. Like most gardens (yours too, I’ll bet) my first one grew, bit by bit, without an overall plan. But now I believe any landscaping project is going to be more successful if you think it through first. By the time I got to my second garden on an acreage, shown above, I did draw up a plan. The project was so big and had so many parts that we had to take quite a bit of time to consider what to do with each area before we started planting. Do I have to get a design on paper? No, you don’t have to draw out a plan, showing where every single perennial plant goes. 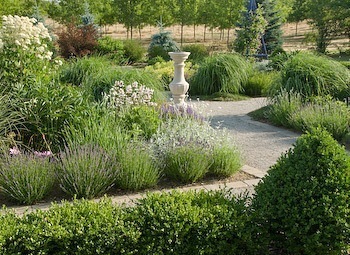 I was trained in garden design, and most of the time I don’t have the patience for that! The pros do it to figure out the exact number of plants to order, but home gardeners usually don’t work that way. When I make a drawing for myself, it’s generally a simple one to show the layout of a bed, and a basic planting plan that shows the most important plants only. 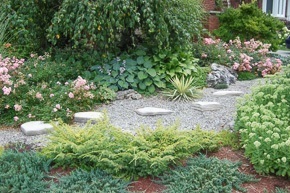 Many people see gardening primarily as getting color into their yards for the summer season. But if you focus on colorful flowers first and foremost, it’s a bit like arranging the lamps, accessories and pictures before your house has got its roof on. I once took a landscape design course taught by the British garden guru John Brookes, author of John Brookes Garden Design. 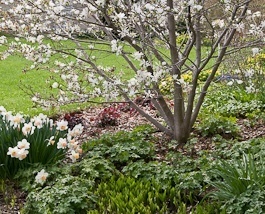 He advises planning and planting in the following order: First, the “specials”, usually large deciduous trees that serve as focal points; next the “skeletons,” evergreens or hedges for year-round structure. Planning your flower garden is a way to avoid the classic dilemma: wandering around with the plants you’ve just bought, wondering where the heck to plant them. Remember, give yourself time – nobody creates a prize-winning flower garden the first year. Basics – Garden style, island bed or border, sun or shade?